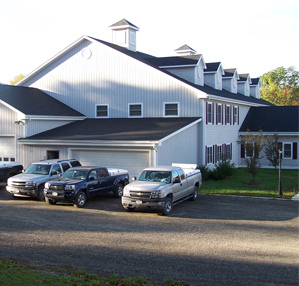 The veterinarians of Rhinebeck Equine, LLP provide emergency services 24 hours a day, 365 days a year. We provide both ambulatory and hospital (surgery, internal medicine) emergency services to our clients, as well as offering referral hospital services to outside veterinarians and horse owners wishing to use our team for their horse’s care. We strive to be a valued resource for our veterinary colleagues throughout the Northeast by offering the highest quality in-hospital care and superior communication with our referring doctors. In the field, our ambulatory veterinarians are available around the clock within our local practice radius to give your horse the care he needs, whatever the problem may be. Each of our field veterinarians has a fully equipped vehicle, and is capable of handling most emergencies in the field. When an injury or illness is severe or requires intensive care, our field veterinarians may recommend that your horse be admitted to the hospital. For emergencies during office hours, our receptionists will dispatch the veterinarian who can arrive most quickly to assess and treat the patient. At night and on weekends, our answering service will page the doctor on call, and pass on the information about the emergency. Within a few minutes, you will receive a call from one of our veterinarians who can begin to help you. Our field veterinarians are ready to attend to emergencies day or night for our clients in the greater Hudson Valley region. For cases being referred to the hospital, either our receptionist or our answering service will take your veterinarian’s call. One of our specialists will speak with your veterinarian regarding your specific emergency. Our team will prepare for your horse’s arrival so we are ready to start care as soon as he arrives. Patients admitted as emergencies to our hospital receive continuous monitoring day and night by our staff of veterinarians and animal health technicians. Our intensive-care stalls feature oxygen ports, specially designed equipment for IV fluid administration, exterior Dutch doors for good ventilation and are generously sized for the comfort of our patients. Our facility also has stalls that can safely accommodate a very sick foal accompanied by its dam when requiring our highest level of critical care and monitoring. When your horse receives care in our hospital, you can be sure that both you and your primary care veterinarian will be kept fully up to date on your horse’s condition and prognosis, and will receive detailed written instructions regarding after-care when he goes home.